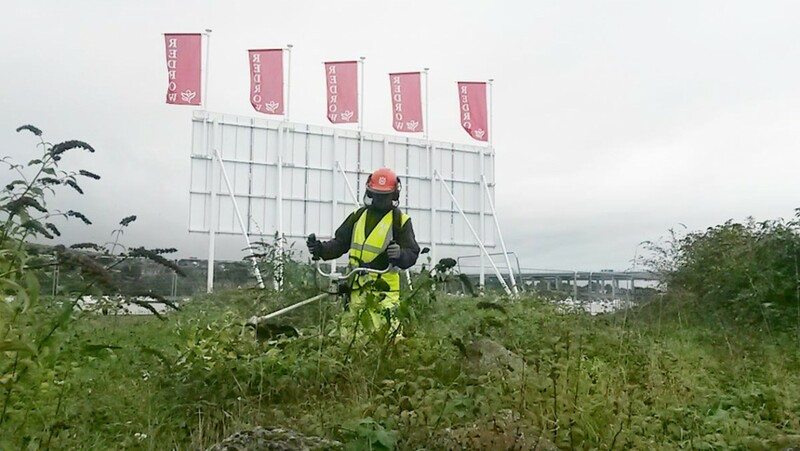 Twig’s Ecological Services team were tasked with vegetation clearance and ecological works for the initial phase of the Temple Water front development in Strood for Redrow Homes. The site is an old cement works on the waterfront which was home to a small population of reptiles and also contained a number of rare and notable species, such as White Mullein Verbascum lychnitis. Timelines were exceptionally tight and required detailed planning with the clients, Ecological consultants and the Kent County Ecologist. Failure to meet the seasonal reptile hibernation time restraints would have caused significant timing and cost issues to our client. Phase one involved the clearance of scrub vegetation from the south western corner in preparation for the construction of an access ramp. This clearance was undertaken following Twig’s detailed method statement and under an ecological watching brief provided by our in-house ecologist. All vegetation was cleared using hand tools due to the difficult topography of the site and the quantity of industrial waste present on the site, such as concrete and steel reinforcing bar. On completion of this, the final stage was for our in-house ecologist to undertake a disturbance survey on all potential hibernation areas within the development footprint. This involves carefully searching areas for reptiles which can then be carefully and safely translocated to an area of suitable habitat outside of the development area. Our partnership with Redrow continues to develop, with Twig’s role as Ecological Services Provider supplying on-going ecological services and consultancy, such as ecological toolbox talks for all contractors working on the site. Twig also continues to liaise with the Kent County Ecologist and the Ecological consultants to protect species on site, as well as provide sustainable and economic solutions to enable the development to move forward.